Columbus Modern Quilters: Vote for Katie in this Spoonflower Contest! 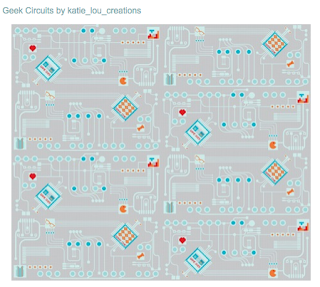 Vote for Katie in this Spoonflower Contest! Katie Paluch entered this gorgeous fabric design into the Fabric8 contest this year sponsored by Spoonflower and Robert Kaufman, and she has made it in the top 100! Now it's all about the votes. Please stop by before May 15th to show your support in this cool contest! 100 Semi-Finalists: Who Will Make the Fabric8?Today we're very pleased to announce the semi-finalists in the Fabric8 Contest from Spoonflower and Robert Kaufman Fabrics. The 100 designs up for voting were selected by a team of fabric industry professionals out of a pool of over 750 entries. Between now and May 15th, vote for your favorite Geek Chic designs. The top eight designers selected by voting will be asked to expand their design into a 4-piece collection before the final votes are cast and the next fabric design superstar is announced! How exciting Katie! Good luck! Sign Up for our June Sew In! Save the Date: Sew In!